On 29 July the Springboks defeated Taranaki in New Plymouth. The real action that day occurred on Molesworth Street, outside Parliament in Wellington. Around 5 p.m. nearly 2000 anti-tour protestors gathered near Parliament grounds intending to march up Molesworth Street on their way to the home of South Africa's consul to New Zealand. The police had established a position in Molesworth Street and declared that protestors were not to proceed up the street. The protestors started marching and were stopped by police using short batons. While some of those marching later argued that the momentum of numbers forced them forward, the police viewed this as a blatant refusal to obey the order to stop. 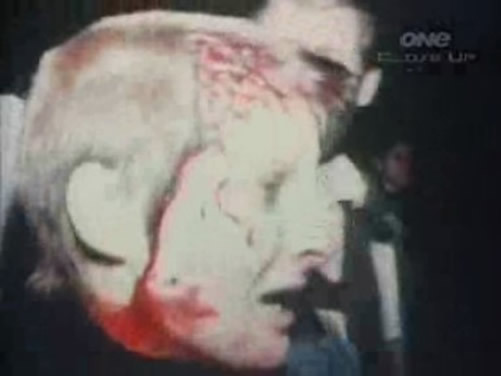 While violence erupted outside the New Zealand Parliament, Prime Minister Robert Muldoon was in London about to attend the wedding of Prince Charles and Lady Diana Spencer. That evening, many New Zealanders were glued to their TV screens to watch the happy couple say their vows, oblivious of events unfolding in the capital. Stunned protestors – some covered in blood – wheeled away in horror and confusion. Chants of 'Shame, shame, shame' broke out and a group of the protestors swung back into the city, heading for the central police station to lay assault charges. The nature of protest action and the policing of the tour had taken an irrevocable turn for the worse. Critics argued that Molesworth Street was about the police reasserting their authority in the aftermath of the cancelled game in Hamilton a few days earlier. The police stated that batons had been used as a last resort and talked of the fears they had for their own safety when confronted by lines of protestors. The 'rule of law' and 'public safety' had to be maintained and at some point no had to mean no. After this incident the police made greater use of long batons, which could be thrust at protestors to force them back. Hi, is there any relative information on how many anti-tour protestors were injured? Hi, I'd love to know the origin of the quote on this page: www.nzhistory.net.nz/culture/1981-springbok-tour/tour-diary - 'A war played out twice a week'. I was in a different location that night protesting. Earlier we had been asked which location we wanted to be at. I was relieved that I hadn't chosen to go to Molesworth Street that night after I heard from some that had got away downtown to tell us what was going on. The tour had boiled over a day or so earlier at the Waikato game. Molesworth Street gave the police an opportunity to hit back. We left Parliament grounds in good humour intending to march to the South African Embassy. As we approached Parliament Gates the police announced that the march should go no further and a line of constables linking arms formed in front of us. The march’s momentum took us into the chain and for a short period the police tried to hold us. Those in the first few rows were sandwiched with no where to go. Two lines of police then formed behind the line of officers holding back the march and started batoning. Using the short plum wood batons commonly employed before the introduction of the more menacing long baton, they beat with little restraint. They targeted high profile anti tour protesters some receiving a fearful beating. I vividly remember one officer setting upon a television cameraman and attempting to smash the high powered lighting he was using to illuminate his filming. I was in the front row of the march and after receiving two blows I fell to my knees and scrambled on to the pavement and then ran down a side alley by the Thorndon fish shop. We later reassembled at Wellington Police Headquarters in a state of shock and anger. I believe that the police intended to make a stand that night and manufactured the confrontation. As the Tour progressed relations between protesters and police worsened culminating in the disorder of the last Test in Auckland. The text below the film doesn't even begin to go near the truth. This was a ptremeditated action by the police. They had decided well before the event that they would do this, and with the sanction, it is believed, of the PM. I found the original clips on the TVNZ site and they don't seem to have updated the web versions. If they do, we would certainly look at providing a higher quality version - assuming the download size wasn't too outrageous. The streaming footage on pages like this makes the site a fantastic resource - I'll be showing my children immediately. But one important question - this video sounds like the audio was recorded in a wind tunnell, so I'm assuming it was uploaded years ago, using now outdated technology. Are there any plans by NZHO to re-load material like this so the video can match the pristine quality of similar videos now shown on TVNZ's own website?